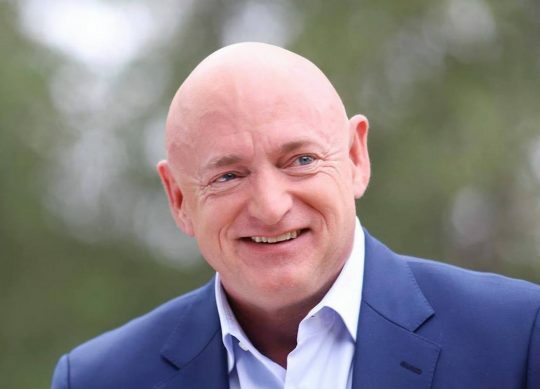 Mark Kelly, a Democrat running for the Senate in Arizona, this week returned $55,000 that he received from a paid speech in the United Arab Emirates last year. Kelly, a former astronaut and the husband of former Rep. Gabby Giffords (D., Ariz.), delivered the speech with his twin brother and fellow astronaut Scott Kelly at an event sponsored by the Crown Prince of Abu Dhabi, Sheikh Mohamed bin Zayed Al Nahyan, as part of a lecture series, CNN reported Friday. While Kelly, who is challenging Sen. Martha McSally (R., Ariz.), has vowed to refuse donations from corporate political action committees, he has faced scrutiny from one of his potential challengers, Rep. Ruben Gallego (D., Ariz.), for breaking his "no corporate PAC money" pledge. Over the span of multiple years, Kelly made at least 19 paid appearances on a corporate speaking tour. CNN reached out to Kelly's campaign last week to inquire about his appearance in the UAE, prompting one of his aides to tell CNN that Kelly received a fee of approximately $55,000 from his speakers bureau, Keppler Speakers. The speakers bureau booked the appearance for Kelly and paid him through a consulting firm, but the aide said that he returned the $55,000 to the speakers bureau earlier this week, CNN reported. According to local reports from the United Arab Emirates, Kelly and his brother spoke at the June 2018 event in Abu Dhabi about human space exploration and the future of the UAE space program. The lecture was titled "The Sky is not the Limit: Life Lessons from NASA's Kelly Brothers" and his appearance was promoted by the US embassy in the country. NASA and the UAE have formal agreements to cooperate on space exploration and research. In a statement to CNN, Kelly's campaign spokesperson, Jacob Peters, said, "Like many other former astronauts, Mark has given speeches to a variety of groups about his experiences in space, the United States Navy, and how he and (his wife, former Arizona Rep. Gabby Giffords) worked together to overcome tragedy. This engagement was focused entirely on Mark sharing his experiences in space and discussing our countries' space programs." In a tweet, Kelly also said he broke the Ramadan fast with the crown prince. Peters has repeatedly defended Kelly's corporate speaking tour by invoking the assassination attempt against Giffords in 2011. As a result of the shooting, Giffords was forced to resign from Congress and never reentered public office. In order to pay for his wife's recovery, Peters said Kelly retired from the Navy and NASA and began giving motivational speeches. The Intercept asked Peters earlier this month whether Kelly would continue giving paid speeches, prompting Peters to say the candidate "has made some previous commitments that he will fulfill, but is not taking any additional engagements." Some of the corporate speaking gigs were sponsored by Goldman Sachs, Optum, and the Mortgage Bankers Association. This entry was posted in Politics and tagged 2020 Election, Arizona, Martha McSally. Bookmark the permalink.